Note to entrepreneurs: it’s really hard to build a new automobile (see Next Autoworks, Chevy Volt, Fisker, Tesla, Edsel). Last week we watched Next Autoworks (the former V-Vehicles) receive what could be a deathblow: the loss of the DOE loan guarantee they needed in order to build a Louisiana factory for a new automobile that was going to "reconstruct a car company." The firm is now looking for "strategic alternatives." Last week, Katie Tweed reported on the media firestorm engulfing the Chevy Volt. In mid-November, the Los Angeles Times reported that officials from the National Highway Traffic Safety Administration found that a lithium-ion battery in a Chevy Volt caught fire more than three weeks after the car was put through crash safety tests. A handful of other crash tests on Volts that purposely damaged the battery have also resulted in two other fires: one caught fire a week later and another began to smoke and spark a few hours after the test. According to the LA Times, one such conflagration consumed three other cars parked nearby. Chevy responded to nervous Volt owners by offering loaner cars to worried drivers. General Motors said it will contact all 5,329 Volt owners with an offer of a loaner after the National Highway Traffic Safety Administration announced Friday it was opening a formal investigation into the fires. The concern is a serious one, and General Motors will have to do damage control during the ongoing investigation to ameliorate drivers’ concerns. Depending on the findings of the investigation, Chevy may even have to go back to the drawing board. Then there's Fisker. Ray Lane of Kleiner Perkins, fresh from his triumph at Next Autoworks, has been busy addressing production delays with the sleek Fisker Karma. According to GigaOm, Fisker "won't ramp up to full production until the second quarter of 2012. Katie Fehrenbacher of GigaOm writes that "Fisker has delayed the launch of the Karma by months and years." According to Green Car Reports, Fisker spokesman Roger Ormisher lays blame for the delay at the feet of various U.S. and state regulatory agencies, who took longer than the company expected to certify the Fisker Karma as legal to sell. The "green-ness" of the Fisker is debatable. After years of focused effort to bring our products to the market, Aptera Motors is closing its doors, effective today. This is a difficult time for everyone connected with our company because we have never been closer to realizing our vision. Unfortunately, though, we are out of resources. Aptera executives had been engaged in exhaustive due diligence with the Department of Energy (DOE) pertaining to an ATVM (Advance Technology Vehicle Manufacturing) loan. Our business plan was examined from top to bottom by internal agency representatives, independent consultants and experts in academia. They did an amazing job of vetting us and they tested every possible weakness in our plan. And after nearly two years of discussions, we had recently received a Conditional Commitment Letter for a $150 million loan. The ATVM loan would have provided funding for the development and commercialization of a five-passenger, midsized sedan (similar to a Toyota Camry) that would be base priced at less than $30,000 and deliver more than a 190 mile per gallon equivalent. The concept of this vehicle had been in place since the very beginning of Aptera, and we had been wholly focused on its development for the last year. The last remaining hurdle was finding new funds to match the DOE loan. We were so optimistic that the company would move forward that we were in discussions to reactivate a mothballed automotive plant in Moraine, Ohio. In the past months we had engaged with the labor union that operated that facility to discuss the hiring of 1,400 new job opportunities. These jobs would have reactivated talented workers who had been dismissed when the facility was closed. During the same time, we continued development of our patent-pending composite manufacturing system that enables energy efficient vehicle production by drastically reducing vehicle weight (by as much as 30%) while tripling its strength. This same patent-pending system allowed us to finish the surface of our composites without manual finishing and without the high capital cost of a typical automotive paint shop. In all, the process would save nearly $750 million versus a typical volume auto assembly plant startup. We were well on the way to satisfying the vision of efficiency on which the company was founded and we are confident that with time and capital we could still achieve our goal. The Aptera formula: aerodynamics plus lightweight design (through composites) delivered efficiency of 206 EPA miles per gallon in tests at Argonne National Labs. That wasn’t a simulation; it was real measured performance. Despite that promise of efficiency, this challenged market -- specifically, large private investors -- did not have an appetite to lead an investment for the perceived low-volume return of our three-wheeled vehicle. So we reprioritized our product plan to four-door sedans, which also cost us time. We remain confident, even as this chapter closes, that Aptera has contributed new technologies to build a future for more efficient driving. Through the dedicated staff at Aptera, our board and suppliers, we have touched this future. All that remains is for someone to grab it. We still believe it will happen. 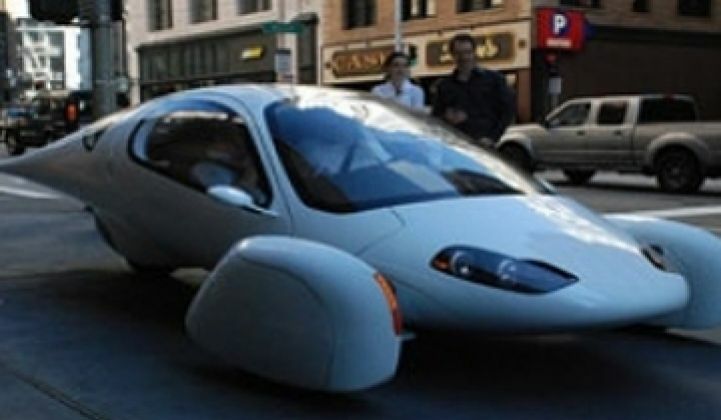 Aptera, had developed an electric three-wheeled car called the Aptera 2e back in 2008 and was working on a four-wheeled vehicle as well. The firm had experienced enormous trouble getting the company funded despite early backing by Idealab and Google. I had seen the "futuristic" car sadly driving around Sand Hill Road looking for money. The 2e was timed at zero to 60 in 10 seconds with a top speed of 90 miles per hour. Over 4,000 customers had placed refundable deposits on the car at one point. Aptera's secret sauce came by using advanced materials and aerodynamics -- the car was supposed to reduce weight and wind resistance and lessen the need for large battery packs and come out at a lower price. Building a new car is hard. Just ask Elon Musk at Tesla, the first new public U.S. automobile company in decades. Or the designers of the Ford Edsel.